Costume includes Jumpsuit, belt and mask. Available in sizes Extra Large (14 to 16). Elastigirl can stretch our her skin to great lengths. This superpower proves useful in every crime fighting events! With her powers and her supportive family, she can defeat any enemy! 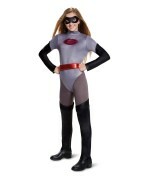 Review(s) for " Incredibles 2 Elastigirl Teen Costume"